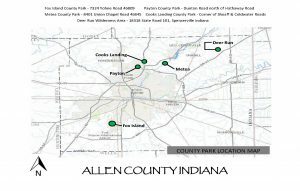 Allen County Parks are only partially tax supported. Operating expenses must be met through user and program fees. Admission is $2.00 per person age 7 and older. Passes are available on an annual basis (good for one year from purchase date) starting at $15.00. Activities at various parks include hiking, swimming, fishing, sledding, cross-coutry skiing (rentals avilable), playgrounds, picnic areas, playfields, and many nature-based programs for all ages. Wheeled vehicles (except wheelchairs) are not permitted on trails, and pets are not permitted in the state nature preserve areas (clearly marked).